The Government of Canada and the Cree Nation Government are working together to advance reconciliation and renew their Nation-to-Nation relationship based on recognition, rights, respect, co-operation and partnership. 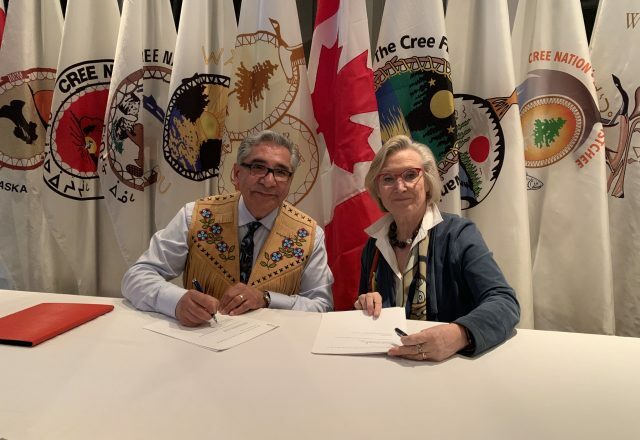 Today, the Honourable Carolyn Bennett, Minister of Crown-Indigenous Relations, and Grand Chief Abel Bosum, Chairperson of the Cree Nation Government, announced the signing of an amendment to the Cree Nation Governance Agreement as a key measure to support the Cree Nation Housing Strategy. Since 2011, the Cree Nation Government and the Cree communities have worked collaboratively to develop the Cree Nation Housing Strategy to address the urgent needs of community members for affordable and adequate housing. A cornerstone of the Housing Strategy is the prioritization of private homeownership by the Crees. As a first step, the amendment to the Cree Nation Governance Agreement will help create a private home ownership market for Crees on their land by removing the previous 75-year term limit on residential land grants for Crees. Minister Bennett also discussed Budget 2019 investments to forgive and reimburse comprehensive land claim negotiation loan debt with the Cree Nation Government. As a result of the proposed Budget investments, loans incurred by the Cree Nation as part of negotiations of the Eeyou Marine Region Land Claims Agreement would be eligible for reimbursement. Forgiving and reimbursing loans would provide additional funding for Indigenous groups like the Cree Nation to invest in priorities like housing and help narrow the socio-economic gap that exists between Indigenous peoples and all Canadians. A joint Canada-Cree Nation working group has been established to develop a Cree‑Canada partnership to implement the Cree Nation Housing Strategy, including areas for potential federal investment, in the context of Section 28 of the James Bay and Northern Quebec Agreement treaty of 1975. Implementation of the Cree Nation Housing Strategy will improve access to housing in Cree communities by: facilitating private home ownership; unlocking value and creating wealth for Cree homeowners; assuming and enhancing federal community housing programs; and expanding business opportunities for Cree entrepreneurs (e.g., construction sector and housing rental market). Under the private housing program, the Cree Nation Government has already set aside very significant resources to facilitate Cree construction and ownership of at least 1,000 new private homes in the Cree communities. The Cree Nation Government has also committed significant funds for related infrastructure investments such as drinking water and waste water facilities and civil works projects. Budget 2019 proposed $1.4 billion over seven years to forgive and reimburse comprehensive land claim negotiation loan debt. This includes up to $938 million in 2018-19 to forgive outstanding comprehensive land claim negotiation loan debt incurred by Indigenous groups, and up to $491 million, over five years starting in 2020-21, to reimburse Indigenous groups with concluded comprehensive land claims who have repaid their negotiation loan debt.